Georgia Green is on the conveyor belt to happiness. Live-in boyfriend, perfect career and great friends, it seems like Georgia is only a Tiffany box away from her happily ever after. But when she arrives in Australia for her best friend’s wedding and is faced with the bridezilla from hell, she starts to realise that she might not want the cookie-cutter ending she thought. 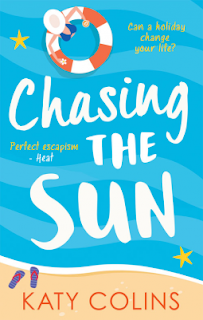 Review: Oh this was the prefect funny, romantic, summer read. I picked this up because I wanted something that would be a little escapist and would make me laugh and that was exactly what I got. I just loved the storyline of this novel. It had everything you could want. A little travel, a little drama, a little relationship trouble, and a lot of growing up. It was all balanced perfectly. There were interesting sub plots and just a lot of fun times. It was fast-paced and so I read it all in one day. It left me feeling warm inside and happy that not everyone has their lives together the way you think they do. Now I haven't read Katy Colins's other novels but I got into this one straight away and so I guess you don't have to have read the others in order to pick this one up. I do know that I have been spoiled for the others so let that be a warning to you! I loved getting to know Georgia. She is a character who i can easily identify with, she could be one of my own friendship group. She is great at looking like she has got it under control when really she's knackered and its all a bit much and I am sure there are plenty of us out there who can totally relate to that when it comes to juggling work, family, friendships and relationships. Her own friendships are also very easy to recognise as the friendships I have and issues I have. I loved the other characters in the novel as well. All of them are completely plausible and all of them felt very real. I enjoyed learning about who they are and reading their storylines though Georgia. Some of the other characters made for the funniest moments in the novel and I just loved the way they all fitted into the storyline. There were some seriously hilarious moments in this novel but I think I liked the fact that this all could have happened to me. I enjoyed the travel, I enjoyed the adventure and I enjoyed the friendships and relationships that were explored in this novel. This was a great read and definitely something to add to your suitcase or over sized handbag this summer! To order your copy, just click here!